Second-gen Asus Eee PC to launch without Intel's Atom? Taiwanese sources say that Asus’ second-generation 8.9-inch Eee PC won’t have Intel’s new Atom processor inside. Instead, they will use older low voltage chips in an attempt to get the machine out before rival machines. We're currently finding out from Asus whether the rumour is true but it seems certain it will be out at the beginning of May - and we'll be seeing it next week! 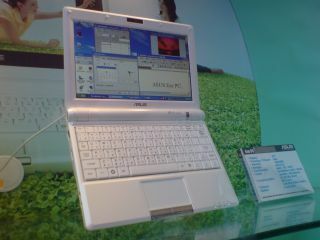 The second coming of Asus' mini marvel has been inextricably linked with Intel’s new ultra-mobile Atom architecture since the two companies shared a stage together at CES 2008 to unveil initial details of the new model – which we have on good authority will be called the Eee PC 900 series. The mumblings come from Taiwanese publication DigiTimes, which has access to local sources but isn’t always accuarte with its rumours. However, as Engadget points out, it was right with the prediction that the new model would be touchscreen and regarding the original launch date. And of course, the lack of Atom could simply apply to the first 8.9-inch models off the line, with Atom architecture supplanting the current Celeron M ULV (Ultra Low Voltage) provision at a later date. The prediction could also only apply to the first tranche of Asian models, with later Euro and US machines to house Atom. HP and Acer are two manufacturers chomping at the bit to reveal Atom-based machines in June, which is when Asus originally wanted to launch its second-gen Eee PC. Asus is hoping to have shifted five million Eee PCs by the end of the year, adds DigiTimes.